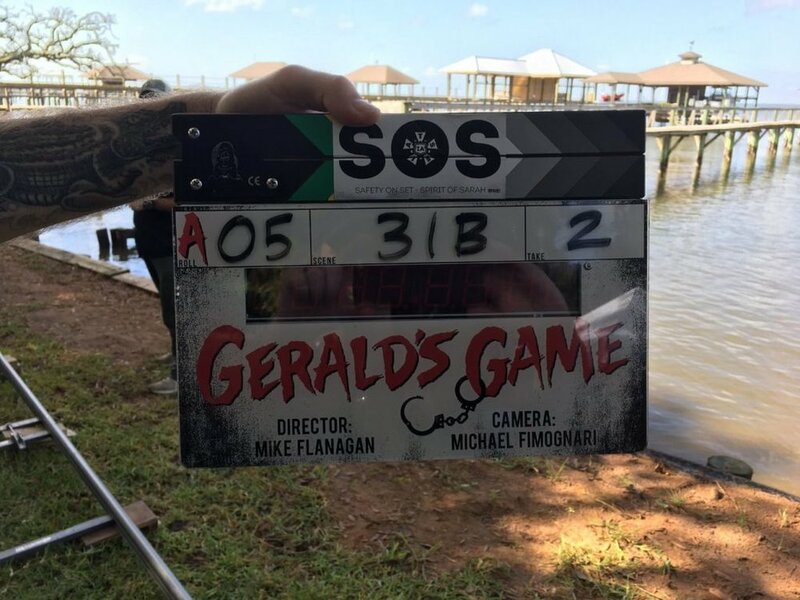 ﻿Gerald’s Game is a suspenseful horror film directed by Mike Flanagan and written by Jeff Howard. It's an adaptation of a Stephen King novel of the same name. It stars Carla Gugino in the greatest role I have ever seen her play, Bruce Greenwood, Henry Thomas, Chiara Aurelia and Carel Struycken. It was released exclusively on Netflix in 2017. Gerald and Jessie Burlingame have found themselves in a slump during their relationship. Both are sexually frustrated as the couple have moved farther apart emotionally. They take a retreat out to a secluded house on a lake. The two aim to cure their sexual issues by engaging in something rather different, handcuffs. Unfortunately, after Jessie’s arms are subdued Gerald gets rough and suffers a heart-attack. He dies and leaves Jessie there, handcuffed to the bed. To make matters worse, the front door was left open with a hungry dog wandering around. As I had said above, this movie is painted with suspense. The moment we meet our happy couple we are showered in tension. Arguments and awkward moments drives the anxiety. When Jessie is alone and left to the darkness in her mind, things really start to take shape. Her past comes full circle and we build to one of the most incredibly effective horror scenes of all time. It made me get up and pace around. I felt flushed. I had to wash my face. Not satisfied, I went and sat in another room for a moment before sipping some water. Then returned to the picture. This was an experience. I really loved how the movie was made. The jump scares were few and very well done. The lighting was spot on. The room got darker, and that ramped the intensity tenfold. The writing was solid. This adaptation really complimented the novel. In fact, this is a case when the movie is actually better than the book. But I still recommend the book. It comes with this cool little map of Maine when the 1963 Eclipse passed overhead. It shows Derry, Castle Rock and Little Tall Island all in the path of that eclipse. I thought that was pretty neat. Gerald’s Game is a solid movie that is a fantastic entry in any Halloween movie marathon. If you are a fan of Stephen King then this is a must see. It’s really graphic and far too intense for younger audiences. But young adults might enjoy it. It’s a movie that I highly suggest and is perfect alongside IT, also from 2017. Stephen King hasn’t had a year this good since the eighties.